Proper drainage of the roof and gutters depends on being clear of debris so the water is carried away with no damage to the house or the landscaping. Gutter cleaning and inspection of the roof line is a periodic task that should be done based on what type of growth is around the house. Poffessional gutter cleaning services are provided by me as the owner of the company and I take it seriously. Clean up after the job is always done so that there a mess left behind. After each gutter cleaning I can provide pictures of any things that look like they need attention. This prevents having to climb of the gutters and their condition. Instead view picture either e-mailed to you or for your review on this web site. In addition I make sure the downspouts are carrying water away from the house's foundation, where it could cause flooding, errosion or other water damage. A well cleaned gutter system helps protect the sofit, exterior walls and can help prevent ice and water damage this winter. I fully understand that many people feel that "Gutters are like a furnace, no one thinks about them till they break. ...You don't think about them till you get dripped on,". 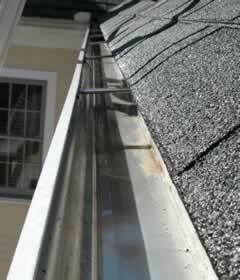 Avoiding having to climb up to the roof and it's risks are a big selling feature of many expensive gutter systems. With the price of these systems we can come to your home, clean and inspect the gutters, and you still save money for years to come. If a gutter cover system is of interest I can save you money. The work to clean a home is called power washing, but to be clear we do not use high pressure water to clean a house. A presssure washer is used to apply the house cleaning solution not to blast dirt off the house. The cleaner breaks the bond of the dirt to the house and it also kills any mold that may be pressent. For heavy mold deposits a brush is used to clean off what may stay behind. Then the house and all plant material in the area is rinsed well so that everything is bright and clean. Garage's often are disorganized places storing bulky stuff and no room for the car. Garage organization is setting up better storage systems and making the garage another functional room of the house. All parts of the room are considered. Homeservices provides great looking garage floor systems from SwissTrax, garage wall systems by StoreWall designed for flexibility and garage accessories. Knowing this I have set up the company which specializes in garage organization and installation of the appropriate components. I will design a Garage Storage System that will fit your budget and make your garage simple to maintain. Licensed home improvement contractor #HIC.0618113 and fully insured.